THE STORY OF ROMULUS AND OF NUMA. This Faustulus took the children and gave them to his wife to rear; and these, when they were of age to go by themselves, were not willing to abide with the flocks and herds, but were hunters, wandering through the forests that were in those parts. And afterwards, being now come to full strength, they were not content to slay wild beasts only, but would assail troops of robbers, as these were returning laden with their booty, and would divide the spoils among the shepherds. Now there was held in those days, on the hill that is now called the Palatine, a yearly festival to the god Pan. This festival King Evander first ordained, having come from Arcadia, in which land, being a land of shepherds, Pan that is the god of shepherds is greatly honoured. And when the young men and their company (for they had gathered a great company of shepherds about them, and led them in all matters both of business and of sport) were busy with the festival, there came upon them certain robbers that had made an ambush in the place, being very wroth by reason of the booty which they had lost. These laid hands on Remus, but Romulus they could not take, so fiercely did he fight against them. Remus, therefore, they delivered up to King Amulius, accusing him of many things, and chiefly of this, that he and his companions had invaded the land of Numitor, dealing with them in the fashion of an enemy and carrying off much spoil. To Numitor, therefore, did the King deliver Remus, that he might put him to death. Now Faustulus had believed from the beginning that the children were of the royal house, for he knew that the babes had been cast into the river by the King's command, and the time also of his finding them agreed thereto. Nevertheless he had not judged it expedient to open the matter before due time, but waited till occasion or necessity should arise. But now, there being such necessity, he opened the matter to Romulus. Numitor also, when he had the young man Remus in his custody, knowing that he and his brother were twins, and that the time agreed, and seeing that they were of a high spirit, bethought him of his grandsons; and, indeed, having asked many questions of Remus, was come nigh to knowing of what race he was. And now also Romulus was ready to help his brother. To come openly with his whole company he dared not, for he was not a match for the power of King Amulius; but he bade sundry shepherds make their way to the palace, each as best he could, appointing to them a time at which they should meet. And now came Remus also, with a troop of youths gathered together from the household of Numitor. Then did Romulus and Remus slay King Amulius. In the meanwhile Numitor gathered the youth of Alba to the citadel, crying out that they must make the place safe, for that the enemy was upon them; but when he perceived that the young men had done the deed, forthwith he called an assembly of the citizens, and set forth to them the wickedness which his brother had wrought against him, and how his grandsons had been born and bred and made known to him, and then, in order, how the tyrant had been slain, himself having counselled the deed. When he had so spoken the young men came with their company into the midst of the assembly, and saluted him as King; to which then the whole multitude agreeing with one consent, Numitor was established upon the throne. After this Romulus and his brother conceived this purpose, that, leaving their grandfather to be king at Alba, they should build for themselves a new city in the place where, having been at the first left to die, they had been brought up by Faustulus the shepherd. And to this purpose many agreed both of the men of Alba and of the Latins, and also of the shepherds that had followed them from the first, holding it for certain all of them that Alba and Lavinium would be of small account in comparison of this new city which they should build together. But while the brothers were busy with these things, there sprang up afresh the same evil thing which had before wrought such trouble in their house, even the lust of power. For though the beginnings of the strife between them were peaceful, yet did it end in great wickedness. The matter fell out in this wise. Seeing that the brothers were twins, and that neither could claim to have the preference to the other in respect of his age, it was agreed between them that the gods that were the guardians of that country should make known by means of augury which of the two they chose to give his name to the new city. Then Romulus stood on the Palatine hill, and when there had been marked out for him a certain region of the sky, watched therein for a sign; and Remus watched in like manner, standing on the Aventine. And to Remus first came a sign, six vultures; but so soon as the sign had been proclaimed there came another to Romulus, even twelve vultures. 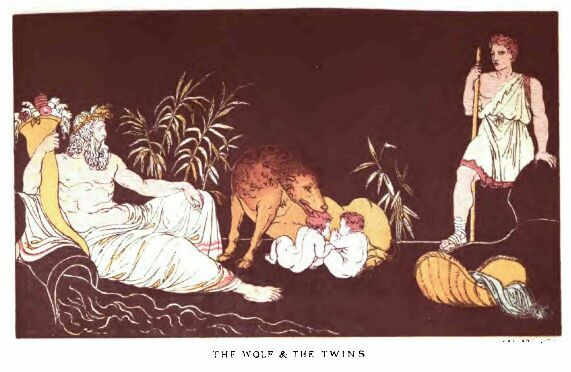 Then they that favoured Remus clamoured that the gods had chosen him for King, because he had first seen the birds; and they that favoured Romulus answered that he was to be preferred because he had seen more in number. This dispute waxed so hot that they fell to fighting; and in the fight it chanced that Remus was slain. But some say that when Romulus had marked out the borders of the town which he would build, and had caused them to build a wall round it, Remus leapt over the wall, scorning it because it was mean and low; and that Romulus slew him, crying out, "Thus shall every man perish that shall dare to leap over my walls." Only others will have it that though he perished for this cause Romulus slew him not, but a certain Celer. This much is certain, that Romulus gained the whole kingdom for himself and called the city after his own name. And now, having first done sacrifice to the gods, he called a general assembly of the people, that he might give them laws, knowing that without laws no city can endure. And judging that these would be the better kept of his subjects if he should himself bear something of the show of royal majesty, he took certain signs of dignity, and especially twelve men that should continually attend him, bearing bundles of rods, and in the midst of the rods an axe; these men they called lictors. Meanwhile the city increased, for the King and his people enlarged their borders, looking rather to the greatness for which they hoped than to that which they had. And that this increase might not be altogether empty walls without men, Romulus set up a sanctuary, to which were gathered a great multitude of men from the nations round about. All that were discontented and lovers of novelty came to him. Nor did he take any account of their condition, whether they were bond or free, but received them all. Thus was there added to the city great strength. And the King when he judged that there was strength sufficient, was minded to add to the strength counsel. Wherefore he chose a hundred men for counsellors. A hundred he chose, either because he held that number to be sufficient, or because there were no more that were fit to bear this dignity and be called Fathers, for this was the name of these counsellors. After this the people bethought themselves how they should get for themselves wives, for there were no women in the place. Wherefore Romulus sent ambassadors to the nations round about, praying that they should give their daughters to his people for wives. "Cities," he said, "have humble beginnings even as all other things. Nevertheless they that have the gods and their own valour to help become great. Now that the gods are with us, as ye know, be assured also that valour shall not be wanting." But the nations round about would not hearken to him, thinking scorn of this gathering of robbers and slaves and runaways, so that they said, "Why do ye not open a sanctuary for women also that so ye may find fit wives for your people?" Also they feared for themselves and their children what this new city might grow to. Now when the ambassadors brought back this answer the Romans were greatly wroth, and would take by force that which their neighbours would not give of their free will. And to the end that they might do this more easily, King Romulus appointed certain days whereon he and his people would hold a festival with games to Neptune; and to this festival he called all them that dwelt in the cities round about. But when many were gathered together (for they were fain to see what this new city might be), and were now wholly bent on the spectacle of the games, the young men of the Romans ran in upon them, and carried off all such as were unwedded among the women. To these King Romulus spake kindly, saying, "The fault is not with us but with your fathers, who dealt proudly with us, and would not give you to us in marriage. But now ye shall be held in all honour as our wives, and shall have your portion of all that we possess. Put away therefore your anger, for ye shall find us so much the better husbands than other men, as we must be to you not for husbands only but parents also and native country." In the meanwhile the parents of them that had been carried off put on sackcloth, and went about through the cities crying out for vengeance upon the Romans. And chiefly they sought for help from Titus Tatius, that was king of the Sabines in those days, and of great power and renown. But when the Sabines seemed to be tardy in the matter, the men of Caere first gathered together their army and marched into the country of the Romans. Against these King Romulus led forth his men and put them to flight without much ado, having first slain their king with his own hand. After then returning to Rome he carried the arms which he had taken from the body of the king to the hill of the Capitol, and laid them down at the shepherds' oak that stood thereon in those days. And when he had measured out the length and breadth of a temple that he would build to Jupiter upon the hill, he said, "O Jupiter, I, King Romulus, offer to thee these arms of a King, and dedicate therewith a temple in this place, in which temple they that come after me shall offer to thee like spoils in like manner, when it shall chance that the leader of our host shall himself slay with his own hands the leader of the host of the enemy." And this was the first temple that was dedicated in Rome. And in all the time to come two only offered in this manner, to wit, Cornelius Cossus that slew Lars Tolumnius, king of Veii, and Claudius Marcellus that slew Britomarus, king of the Gauls. After this, King Tatius and the Sabines came up against Rome with a great army. And first of all they gained the citadel by treachery in this manner. One Tarpeius was governor of the citadel, whose daughter, Tarpeia by name, going forth from the walls to fetch water for a sacrifice, took money from the King that she should receive certain of the soldiers within the citadel; but when they had been so received, the men cast their shields upon her, slaying her with the weight of them. This they did either that they might be thought to have taken the place by force, or that they judged it to be well that no faith should be kept with traitors. Some also tell this tale, that the Sabines wore great bracelets of gold on their left arms, and on their left hands fair rings with precious stones therein, and that when the maiden covenanted with them that she should have for a reward that which they carried in their left hands, they cast their shields upon her. And other say that she asked for their shields having the purpose to betray them, and for this cause was slain. Thus the Sabines had possession of the citadel; and the next day King Romulus set the battle in array on the plain that lay between the hill of the Capitol and the hill of the Palatine. And first the Romans were very eager to recover the citadel, a certain Hostilius being their leader. But when this man, fighting in the forefront of the battle, was slain, the Romans turned their backs and fled before the Sabines, even unto the gate of the Palatine. Then King Romulus (for he himself had been carried away by the crowd of them that fled) held up his sword and his spear to the heavens, and cried aloud, "O Jupiter, here in the Palatine didst thou first, by the tokens which thou sentest me, lay the foundations of my city. And lo! the Sabines have taken the citadel by wicked craft, and have crossed the valley, and are come up even hither. But if thou sufferest them so far, do thou at the least defend this place against them, and stay this shameful flight of my people. So will I build a temple for thee in this place, even a temple of Jupiter the Stayer, that may be a memorial to after generations of how thou didst this day save this city." And when he had so spoken, even as though he knew that the prayer had been heard, he cried, "Ye men of Rome, Jupiter bids you stand fast in this place and renew the battle." And when the men of Rome heard these words, it was as if a voice from heaven had spoken to them, and they stood fast, and the King himself went forward and stood among the foremost. Now the leader of the Sabines was one Curtius. This man, as he drave the Romans before him, cried out to his comrades, "See we have conquered these men, false hosts and feeble foes that they are! Surely now they know that it is one thing to carry off maidens and another to fight with men." But whilst he boasted himself thus, King Romulus and a company of the youth rushed upon him. Now Curtius was fighting on horseback, and being thus assailed he fled, plunging into a certain pool which lay between the Palatine hill and the Capitol. Thus did he barely escape with his life, and the lake was called thereafter Curtius' pool. And now the Sabines began to give way to the Romans, when suddenly the women for whose sake they fought, having their hair loosened and their garments rent, ran in between them that fought, crying out, "Shed ye not each other's blood ye that are fathers-in-law and sons-in-law to each other. But if ye break this bond that is between you, slay us that are the cause of this trouble. And surely it were better for us to die than to live if we be bereaved of our fathers or of our husbands." With these words they stirred the hearts both of the chiefs and of the people, so that there was suddenly made a great silence. And afterwards the leaders came forth to make a covenant; and these indeed so ordered matters that there was not peace only, but one state where there had been two. For the Sabines came to Rome and dwelt there; and King Romulus and King Tatius reigned together. Only, after a while, certain men of Lanuvium slew King Tatius as he was sacrificing to the gods at Lavinium; and thereafter Romulus only was king as before. When he had reigned thirty and seven years there befell the thing that shall now be told. On a certain day he called the people together on the Field of Mars, and held a review of his army. But while he did this there arose suddenly a great storm with loud thunderings and very thick clouds, so that the king was hidden away from the eyes of all the people. Nor indeed was he ever again seen upon the earth. And when men were recovered of their fear they were in great trouble, because they had lost their King, though indeed the Fathers would have it that he had been carried by a whirlwind into heaven. Yet after awhile they began to worship him as being now a god; and when nevertheless some doubted, and would even whisper among themselves that Romulus had been torn in pieces by the Fathers, there came forward a certain Proculus, who spake after this manner: "Ye men of Rome, this day, in the early morning, I saw Romulus, the father of this city, come down from heaven and stand before me. And when great fear came upon me, I prayed that it might be lawful for me to look upon him face to face. Then said he to me, 'Go thy way, tell the men of Rome that it is the will of them that dwell in heaven that Rome should be the chiefest city in the world. Bid them therefore be diligent in war; and let them know for themselves and tell their children after them that there is no power on earth so great that it shall be able to stand against them.' And when he had thus spoken, he departed from me going up into heaven." All men believed Proculus when he thus spake, and the people ceased from their sorrow when they knew that King Romulus had been taken up into heaven. And now it was needful that another king should be chosen. No man in those days was more renowned for his righteousness and piety than a certain Numa Pompilius that dwelt at Cures in the land of the Sabines. Now it seemed at first to the Senate that the Sabines would be too powerful in the state if a king should be chosen from amongst them, nevertheless because they could not agree upon any other man, at last with one consent they decreed that the kingdom should be offered to him. And Numa was willing to receive it if only the gods consented. And the consent of the gods was asked in this fashion. Being led by the augur into the citadel, he sat down on a stone, with his face looking towards the south, and on his left hand sat the augur, having his head covered and in his hand an augur's staff, which is a wand bent at the end and having no knot. Then looking towards the city and the country round about, he offered prayers to the Gods and marked out the region of the sky from the sunrising to the sunsetting; the parts towards the south he called the right, and the parts towards the north he called the left; and he set a boundary before as far as his eye could reach. After this he took his staff in his left hand and laid his right on the head of Numa, praying in these words: "Father Jupiter, if it be thy will that this Numa Pompilius, whose head I hold, should be King of Rome, show us, I pray thee, clear tokens of this thy will within the space which I have marked out." He then named the tokens which he desired, and when they had been shown, Numa was declared to be King. King Numa, considering that the city was but newly founded, and that by violence and force, conceived that he ought to found it anew, giving it justice and laws and religion; and that he might soften the manners and tempers of the people, he would have them cease awhile from war. To this end he built a temple of Janus, by which it might be signified whether there was peace or war in the State; for, if it were peace, the gates of the temple should be shut, but if it were war, they should be open. Twice only were the gates shut after the days of Numa; for the first time when Titus Manlius was Consul, after the ending of the first war against Carthage, and for the second time when the Emperor Augustus, after vanquishing Antony at Actium, established universal peace both by land and sea. This temple then King Numa built, and shut the gates thereof, having first made treaties of peace with the nations round about. Many other things did King Numa set in order for his people. First he divided the year into twelve months, each month being according to the course of the moon, and in every twenty-fourth year another month, that the year might so agree with the course of the sun. Also he appointed certain lawful days for business, and other days on which nothing might be done. He made priests also, of whom the chief was the priest of Jupiter, to whom he gave splendid apparel and a chair of ivory. Two other priests he made, one of Mars, and the other of Quirinus, that is to say, of Romulus the god. And he chose virgins for the service of Vesta, who should keep alive the sacred fire, and twelve priests of Mars, whom he called the Salii, to be keepers of the sacred shield. (This shield, men said, fell down from heaven, and that it might be kept the more safely, King Numa commanded that they should make eleven other shields like unto it.) This shield and its fellows the Salii were to carry through the city, having on flowered tunics and breastplates of brass, and dancing and singing hymns. And many other things as to the worship of the gods, and the interpreting of signs, and the dealing with marvels and portents, King Numa set in order. And that the people might regard these laws and customs with the more reverence, he gave out that he had not devised them of his own wit, but that he had learnt them from a certain goddess whose name was Egeria, whom he was wont to meet in a grove that was hard by the city. King Numa died, having reigned forty and three years; and the people chose in his room one Tullus Hostilius.